After a very progressive 2008 where the Renault team made great strides to get back in front of the grid, double champion Alonso is already looking forward to 2009, a year in which he hopes the team can build upon the progress of the year before. 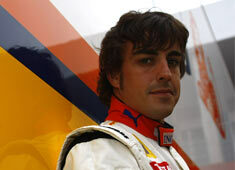 Fernando, how have the team’s preparations gone this winter? The team has had a very busy development programme to allow us to be ready for the first January test with the new car. The factories in Enstone and Viry have been working flat-out and the whole team has worked very hard over the last few weeks. I went to Enstone several times over the winter to complete my seat-fit in the R29 and to talk with my engineers so that I could follow the progress of the project carefully. Now we are all looking forward to seeing the result of all that effort on the racetrack. So we are enormously motivated and I think it’s fair to say that overall our preparations have gone very smoothly. You have followed the development of the R29 project over the last few months. What are your first impressions of your new car? I’ve been impressed by the work the team has achieved. Aesthetically, it’s true that the R29 is very different to the R28, but this is a consequence of the new aerodynamic regulations. The 2009 season represents a real challenge on all levels and we will have to wait for the first few races of the season to see whether the decisions that we have taken have been the right ones. But the team can be satisfied with the work that has been achieved over the last few months. How are you approaching this new season with Renault? After a difficult start to last year, we made good progress and improved our performance to become one of the most competitive teams in the second half of the season. Our two victories in Singapore and Fuji were very important as they were the confirmation of the progress we had made. I have said before that I feel comfortable in this team and I am happy to continue this adventure with Renault. We have shared some incredible moments together and I hope there will be more this year. I’m confident and motivated, as I think the whole team is. This year sees the introduction of radical new technical regulations - do you think that Renault has coped well with these changes? Rule changes happen regularly in Formula 1; each year we see new sporting and technical regulations and the teams are used to dealing with the challenges that this presents. It can shake up the order a bit, but it’s usually the same teams that you find at the front and I’m sure that will be the case once again this season. In the past Renault has shown that it is good at adapting to rule changes and the team started to work very early on the R29 project so hopefully this will pay us back on the racetrack. Will the new technical rules introduced this year change the pecking order among the teams? As I have said, the top teams always remain more or less at the front, even with the introduction of new rules. This will certainly be the case this year and you can expect to see both Ferrari and McLaren in a strong position from the start of the season. But it’s difficult to evaluate for certain how good a job everyone has done before the first test session or even before the first Grand Prix. I think that before worrying about our competitors, we are going to concentrate on our winter development programme to try and make good progress and approach the first Grand Prix in the best shape possible. We will then see where we are in the pecking order. That’s right - it’s important to keep some stability in the team and I’m happy to continue working with Nelson. To achieve our objectives, it’s essential for the team to have two competitive cars and therefore two competitive drivers. I think Nelson learnt a lot last year and we worked well together. I’m sure that will be the case once again this year. You helped Renault fight back last year with two victories. What are your ambitions for 2009? The 2008 season was intense, with the team making amazing progress. It was therefore important to meet the expectations that we had with the victories in Singapore and Japan. We won together in 2005 and 2006 and I’ve always said that I want to win a third world title and hopefully it will be possible to fight for the championship again this year. But before that, it’s vital that we work hard this winter on our development programme and that is what I will concentrate on in the weeks leading up to the Australian Grand Prix.